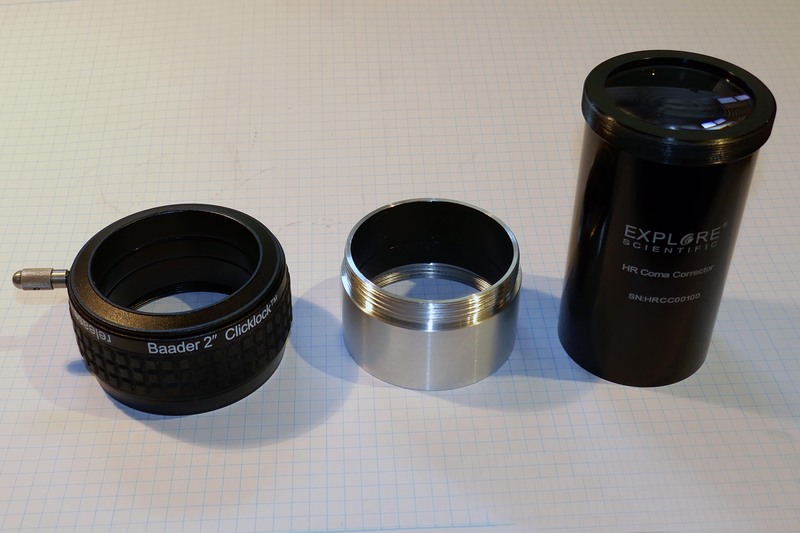 The eyepiece clamping of my new ES HRCC was operating well, but I disliked it, anyway. Reasons have been mainly the loose thread and the need to clamp three screws after each eyepiece change. So I replaced the clamping unit with the more solid Baader Click Lock. It was not my idea, I found it at the astronomie.de board and it was suggested by portaball. 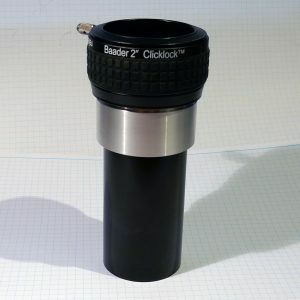 I choosed the ClickLock with the M56x1 Celestron / Skywatcher thread, because it was one of the low-priced ones and the thread is quite easy to manufacture at my (mini) lathe. Of course I had to „parfocalise“ my eyepieces, but this was easily done by fixing 2″ to 1 1/4″ adaptors to my 1 1/4″ ones. My 2″ are almost homofocal. The Baader Click Lock is really a good thing: solid and clamping even the heaviest eyepiece without the need to apply large forces. Parts of the new set-up: Click Lock, M54x0.75 to M56x1 adapter, the ES HRCC without the ES clamping ring. The parts of my coma corrector set-up are shown in the next picture. A simple drawing can be found here.